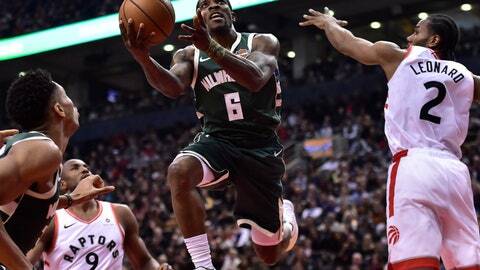 TORONTO (AP) — Malcolm Brogdon hit tying and go-ahead 3-pointers in the final 67 seconds and the Milwaukee Bucks held on to beat the Toronto Raptors 104-99 on Sunday night. Serge Ibaka scored 22 points and Kawhi Leonard had 20 for the Raptors, who have lost two straight, the second time this season they’ve suffered consecutive defeats. Toronto, which lost 106-105 at Brooklyn on Friday, dropped three straight from Nov. 12 to 16, losing at home to New Orleans and Detroit before an overtime defeat at Boston. Toronto’s Kyle Lowry shot 0 for 5 and didn’t score for the first time this season. Lowry led the Raptors with seven assists. DETROIT (AP) — Jrue Holiday scored 37 points and Julius Randle added 28 as New Orleans dealt Detroit its fourth straight loss. Pelicans star Anthony Davis left with a right hip injury after a first-quarter collision with Blake Griffin. Davis returned early in the third quarter, but finished with only six points — three before the injury. He also had five blocks and nine rebounds. SAN ANTONIO (AP) — DeMar DeRozan had 26 points and eight rebounds and Rudy Gay added 23 points and 15 rebounds as San Antonio won its second straight after dropping four of five. NEW YORK (AP) — Kemba Walker scored 25 points and Jeremy Lamb added 19 to lead Charlotte past New York.